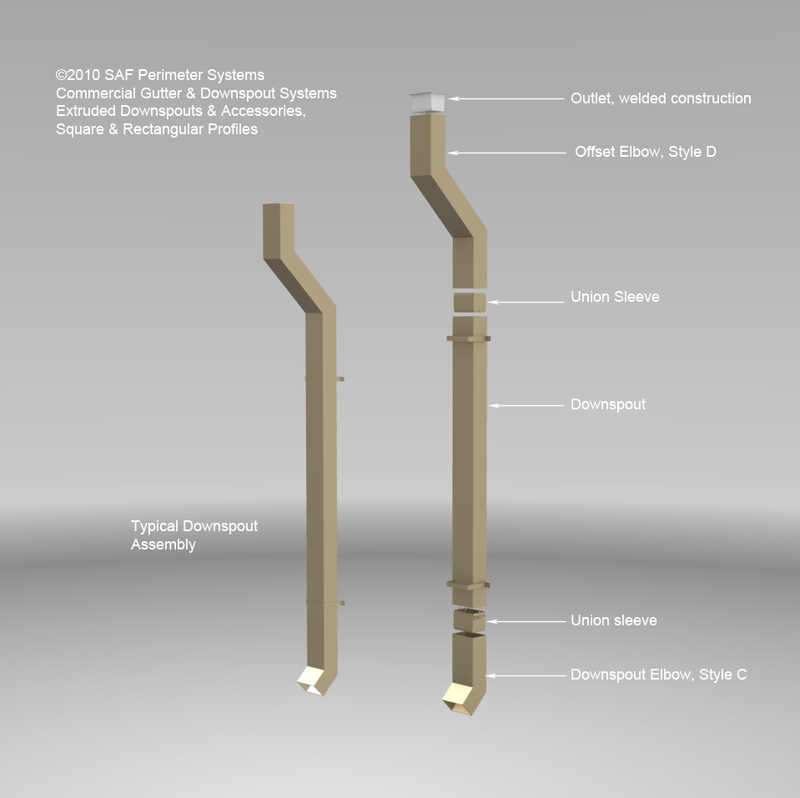 Gutter Downspouts - SAF - Southern Aluminum Finishing Co, Inc. SAF – Southern Aluminum Finishing Co, Inc.
SAF Perimeter Systems Designer Series Commercial Downspouts are available in a variety of styles, metals, shapes, and sizes. Profiles include Square, Rectangular, Open Face and Round. Downspout styles include Extruded, Formed and Ornamental Rolled. 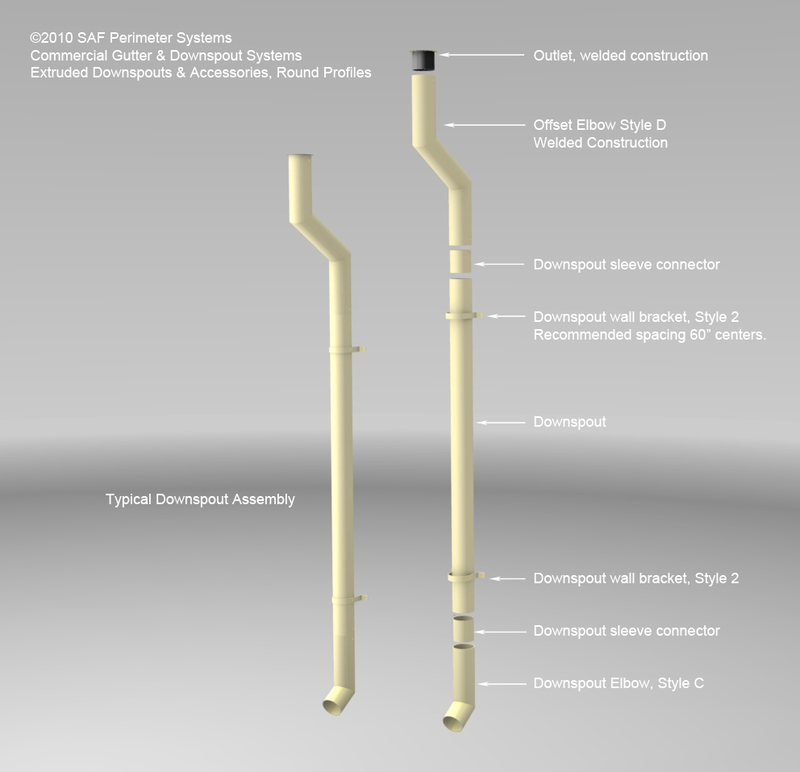 Each is compatible with all SAF Designer Series and Industrial Series Gutter Systems. Custom Commercial Downspouts may be available. Please submit design and specification requirements via link below, or call SAF Perimeter Systems at 800-334-9823 ext 811 for review and project quote. Special order charges may apply. Aluminum extruded downspouts with a rigid 0.125” wall thickness makes them ideal for heavy traffic areas or where abuse may occur. TThe extruded style system is available in 8 standard sizes for the square / rectangle shapes and 4 standard sizes for the round. Each comes in a standard length of 10’ and can be special ordered in custom lengths up to 20’. Joint treatment consist of a concealed union sleeves factory painted and installed in the field. Formed aluminum downspouts are manufactured in square and rectangular profiles with an optional open face design in a variety material and wall thicknesses. The standard two piece formed system is available in 7 sizes, 10’ lengths. Custom sizes/lengths are available. System is factory sealed and assembled. Joints are concealed union sleeves factory painted for field installation. 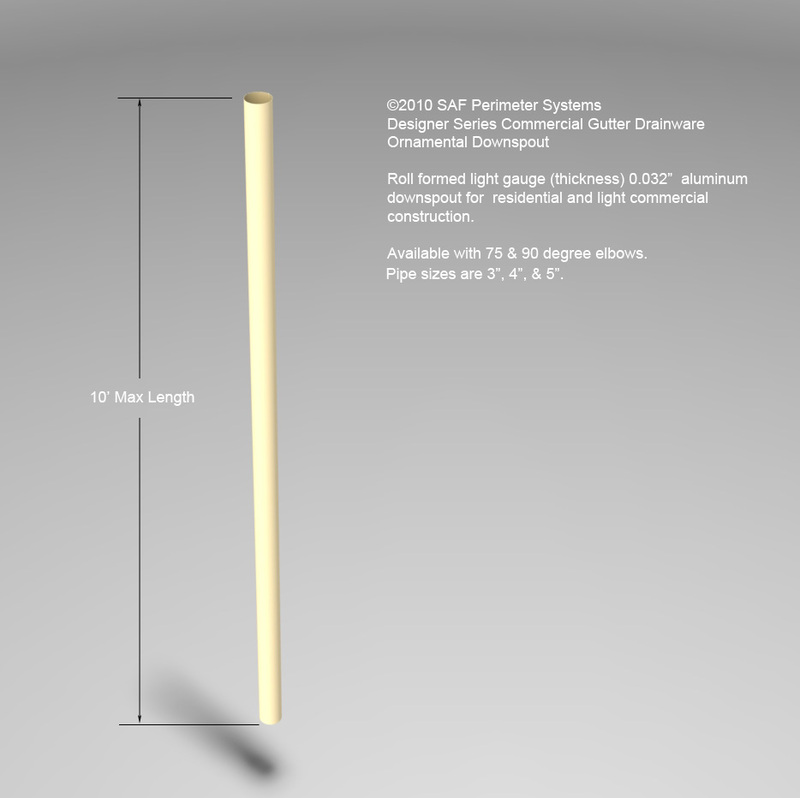 Rolled formed downspouts manufactured out of light gauge materials in 4 sizes, 10′ lengths. Custom sizing is not available. Commercial Gutter System Specifiers should consider using alternative downspout types if the downspout may be subjected to abuse or vandalism.